Take a night out together with a partner on the all new Boomerbuggy 2 Seater. 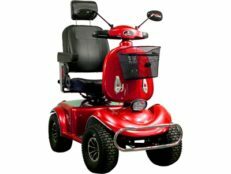 This mobility scooter gives the rider by themselves or with another person side by side. The push and pull throttle makes it easy for anyone to operate with either hand. The Boomerbuggy 2 Seater also comes with a seatbelt for safe riding, headlights, turn signals, adjustable speeds and more. It also comes with a lockable front basket great for carrying groceries or storing your charger. Never leave a friend or family member behind with the Boomerbuggy 2 seater.